Can I tell you something? I love Pinterest, and I love trying out the ideas on my boards. Do you know what makes me sad? When I try one of those ideas, and it fails miserably! My finger nails aren't painted often, because it's too high-maintenance for me. They're pretty for all of two days, and then they look drab, scuffed, and chipped. However, when I finally do decide it's time to paint them again, it's really fun for me. It seemed simple enough, and I had all the supplies already, so I gave it a whirl. I painted my nails the night before. 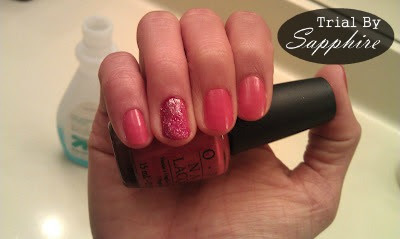 I applied the tape and painted with glitter polish. I peeled the tape, and... it didn't work. 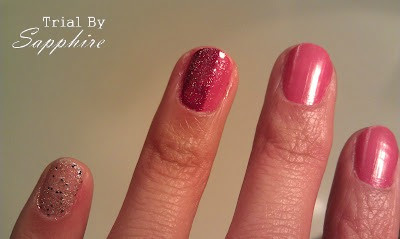 The tape pulled up my base color and ripped along the glitter polish. 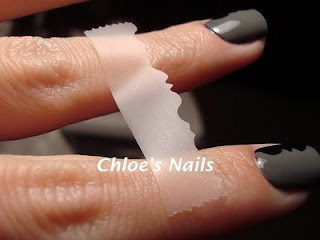 - Make the tape less tacky by placing it on my skin first. 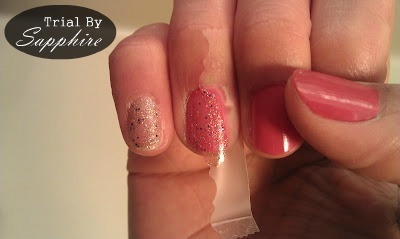 - Paint the glitter polish and then immediately remove the tape. 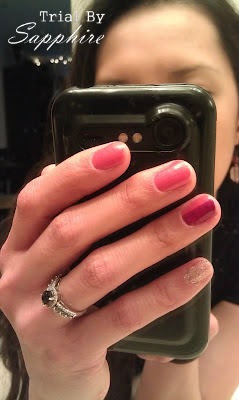 I still wanted to do something fun, so I added a darker color to half of my ring fingers. ... and brushed it sideways to blend the colors in the middle. 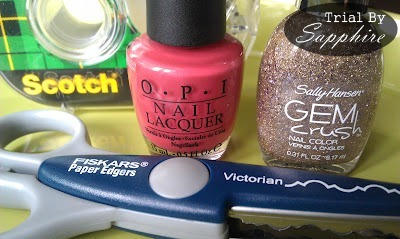 The color is darker on the pinky-side. I still wanted a slight two-tone effect. 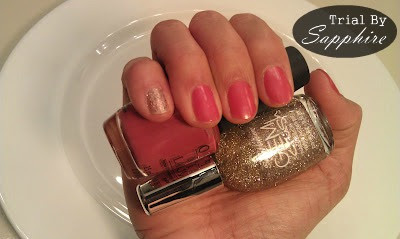 And I changed my pinky polish while I was at it. No tape. No design scissors. But good enough for me! And in my defense, I'm sticking to one of my reasons for writing this blog. I should try everything, even if I don't think I'll be good at it. It's all Trial By fire Sapphire. If you have any other tips on how to make this work, please tell me. I'm determined to get those nails! oh shoot! good advice because I have this pinned and was gong to try it sometime..now I know how to proceed! They ended up looking great though! Have a great day!! Hey your nails still came out good! I only paint my nails like every other week (but my toes are ALWAYS painted). p.s. stopping by from Emmy June's blog. I'm still on the "too high maintenance" bandwagon. But I think your end result is pretty rad. And we will totally do homemade mani-pedis during our real life girl's weekend. Your nails look great either way. It's always a bummer when things don't go as planned. Oh please post that to Pinterest as a FAIL :) HAHA I love ya!! Hey girl! I've done these manis a LOT!!! Definitely do put the tape on the back of your hand or palm first-- it always helps. And yes, take the tape off right after polishing... it's a must. Chloe always also uses Seche Vite topcoat between her polishing and taping to make sure that it is all the way dry... maybe that can help!